The Church coming together as a coordinated whole will take more than good intentions or striving on our part. It begins by being motivated by our love for God but must also include love for one another. Most people find it hard to work together in unity and harmony with people they don’t love. Even human love and affection tends to make people more cooperative with each other. But, we aren’t just talking about a friendship sort of love being able to bring coordination to a church full of diversity with multi-faceted ministries and volunteers. People with different philosophies, perspectives, and preferences need something that cements them together that is beyond them or they’ll soon fracture, with this person off doing their thing, that one doing their thing, etc. God’s love (agape) provides the means of coming together with all of our differences as a coordinated whole. Promote a purpose that is high enough to make people want to come together in harmony and cooperation. 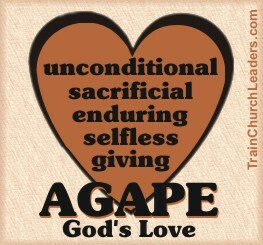 Only God’s love is selfless and sacrificial enough to cause us to look toward the good of others.